Found this randomly on the internet, and I have a question about her piercing : how do you do those cheek piercings?Ã‚Â Do they go in differently?Ã‚Â How long can you keep them? I have no idea. Alternatively you could glue those little silver balls you see on cakes to your face. It’s a bar under her skin. Sort of like the bar you’d get in your eyebrow. and you can keep it forever as long as you take care of it. there are two methods these piercings are usually performed. One way is to use a barbell that has been bent to have 2 90 degree angles at both ends forming a “staple” shape, the other way is to use a flexible plastic bar. There is great debate amongst piercers about which is the correct method. I can see advantages to both although I prefer the first method. I thinks it’s just an anti-eyebrow piercing positioned a little lower than usual. Either way, there is a ridiculously high chance of rejection, so it’s unlikely you would be able to keep it for long, and you’d probably be left with a big ugly scar on your face afterwards. Hawt. 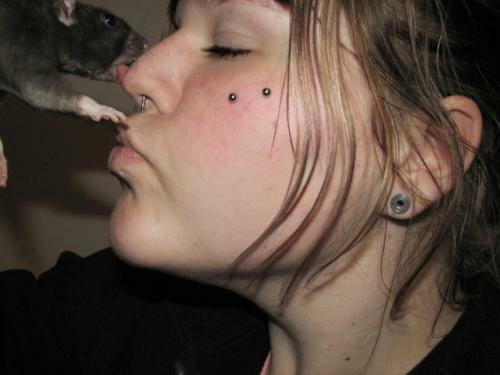 I think the rat is way cuter than the girl anyway. These are no piercings. They’re 2mm projectiles. I mean, they DO have penetration issues.